There Family Night programs strive to encourage kids and parents to do things together, and reading together is an activity that is fun, but may also have a lasting impact on a child,” said Mike Griffith, Director of Marketing for Ovation Brands and Furr’s Fresh Buffet. “Are thrilled to offer a Family Night based on the popular Night Night book series and help families spend more special and memorable moments together.” Amy Parker is a successful author, who has sold more than 1 million copies of her books. Her Night Night series helps children prepare for a calming night of sleep. The series includes themes ranging from farm animals to moms and dads to trains. 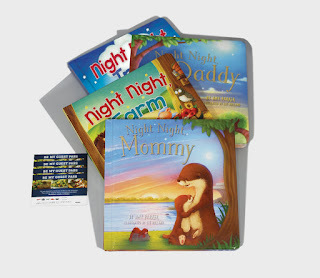 "Tommy Nelson Publishing is delighted to be partnering with Ovation Brands for their fun Family Nights with our Night Night book series by Amy Parker", said Ann Janette Toth, Senior Marketing Director Children’s Books/Tommy Nelson. 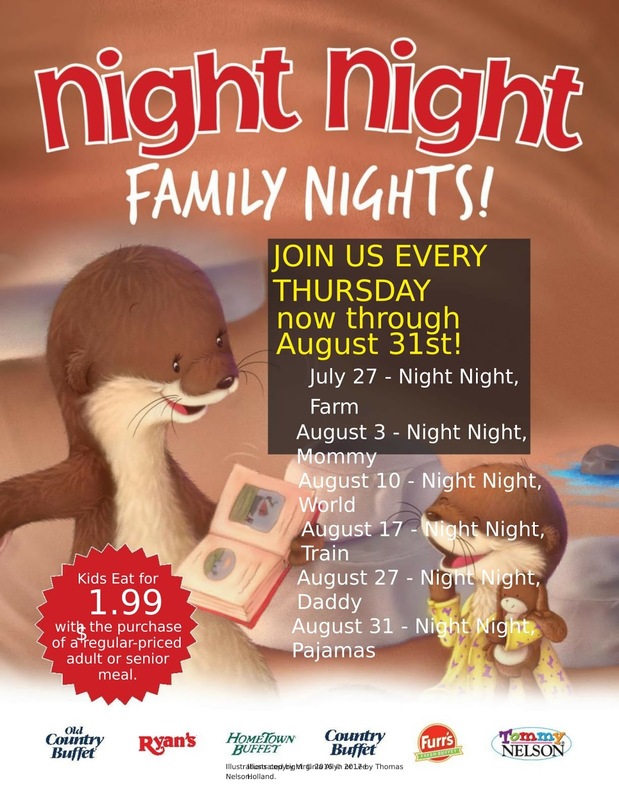 "We believe that reading to your children as part of the bedtime routine will instill a love of reading for a lifetime.” The Night Night Family Night promotion will feature different themes and activities every Thursday. Kids will enjoy Night Night-inspired fun with the following scheduled weekly themes. 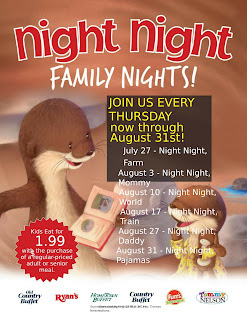 ● August 31 – Night Night, Pajamas In addition to making reading and family time fun, Family Night also serves up homestyle meals for kids and parents to enjoy together. Every Thursday from 4 p.m. - close, kids eat for just $1.99 with the purchase of a regular-priced adult or senior meal. Menus may vary. Age restrictions apply. For more information about Family Night, visit www.Ryans.com , www.HomeTownBuffet.com, www.CountryBuffet.com , www.OldCountryBuffet.com or www.Furrs.net. The Night Night Farm book is their favorite. Night Night farm would be the toddlers favorite. Night night train, would be wonderful. The Night Night, World book is my kids' favorite, but they like them all! The Night Night Farm book is the kid's favorite. My kids like Night Night, World the best. Both my boys like Night Night, World the most out of the series. Night Night train would be awesome. The kids love Night Night Train and so do I. Night Night, World is our favorite. Night, Night world looks interesting. Out of the set, my kids like Night Night, World the best. The kids also love Night Night World. My kids like Night Night, World. The kids so love the Night Night Farm book. My kids love Night Night, World! The kids also love the Night Night daddy book. My kids reach for Night Night, World first! The kids love Night Night Mommy. Our favorite is Night Night, World! The kids love Night Night train and I think it is super cute too. Night Night, World is our favorite out of the series of books. The kids love Night Night Daddy and I think it is super cute too. We like to read Night Night, World the most! The kids so love Night Night Farm. My boys like all of the Night Night books...Night Night, World is their favorite!